The SEIKO Credor Spring Drive Sonnerie is a classic mechanical wrist watch that features the Hour Striking Function. It is the first striking watch built by the Japanese watch making giant SEIKO. Introduced in 2006, the Credor Spring Drive Sonnerie (Ref GBLQ998) is a land mark timepiece that adds a golden feather to SEIKO’s unmatched achievements in horology in its 100 years of rich history. This Grande complication model has been derived from the enormous success of Spring Drive, a watch that presents, visually, the pure, natural and continuous motion of time. The challenge was to express the passage of time in sound as well as by the smooth movement of the hands across the dial. The challenge was taken up by a small and elite team of watch making craftsmen in SEIKO Epson under the leadership of Mr. Kenji Shiohara. This team, “the Micro Artist Studio,” was guided by a shared passion for the creation of distinctively Japanese timepieces which express both the technical skill of SEIKO and the cultural heritage of Japan. 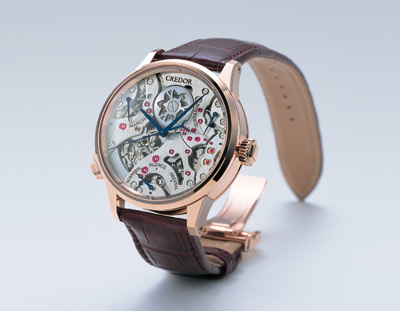 The result is a unique and hugely innovative timepiece which conveys to both eye and ear the serene flow of time. The continuous stream of each second, minute and hour is indicated by the quiet revolution of the glide-motion hands around the dial, and the time is also marked by a unique chime expressed in a softly tinkling “hanging” bell. This bell chime resonates with the cultural heritage of Japan and is instantly recognizable as an auditory symbol of the nation’s centuries of tradition. The watch is built on the base of the ground-breaking Spring Drive movement 7R series with its glide-motion hands and 48 hour power reserve. Onto this Spring Drive movement is added the “sonnerie” mechanism which has its own, entirely separate barrel, ensuring that this mechanism has more than 40 hours of power reserve. The power reserve is shown on a second indicator at the two o’clock position. The movement is easy to operate with just the one crown at the 3 o’clock position and a mode indicator at 6 o’clock. The movement comprises over 600 individual parts, each uniquely made and, of course, hand assembled and finished to the highest levels of precision. The “sonnerie” mechanism has an hour striking function. It is built around typical Japanese hanging bell sound. This was chosen because its unique and lingering sound harmonizes with the natural flow of time and space. Purity of sound was the greatest challenge, and the achievement of the perfect bell sound was made possible by the remarkable combination of a bell system, the use of a newly developed governor and the unique sound escape system that allows the chime sound to pass through the case. This governor mechanism is a remarkable innovation. It uses the viscosity of air so that the chime sounds at very precise intervals and there is no other sound to interfere with the pure strike of the bell. Combined with the entirely silent Tri-synchro regulator, the absolute silence of the whole movement is ensured and the complete purity of the sound is the delightful result. The hour striking function can be set to one of three different modes: an hourly strike, three hourly strike, or silence. To power the hour striking function, a spring exclusive to this mechanism is used in parallel with the watch mechanism’s barrel. The hour repeating function announces the current time by chiming each hour when the button located at the 8 o’clock position is pressed. A silent function is included so that chiming can be muted as long as the button located at 8 o’clock position is pressed halfway down. The movement has a “fail-safe” mechanism to prevent the chime sounding when inappropriate actions are performed by mistake. 1. “Sonnerie” mode: the number of hours is automatically counted by chiming every hour on the hour. 2. “Original” mode: the time is announced by a three-strike chime at the passing of every three hours: 12:00, 3:00, 6:00, and 9:00. 3. “Silent” mode: the chime is disengaged. As befits a watch of such intricacy and sophistication, the strike hammer is visible through the dual surface curved sapphire crystal. The case itself is crafted from 18-karat pink gold, which not only reflects the value of the movement but assists the purity of the sound of the chime. On the mainspring barrel of the bell mechanism, a cutout Japanese bellflower (Kikyo flower in Japanese) drifts down on a river, symbolizing the continuous flow of time. The Japanese bellflower is chosen because it is the flower of the city where the Micro Artist Studio is located.